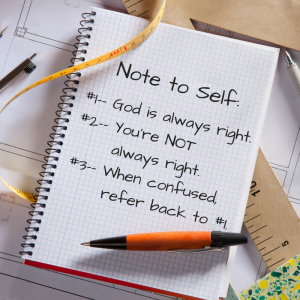 God’s ways are always best. Any other voice except The Voice. Success in developing a tender heart begins with listening to God. And we’re going to go to the source, Scripture, of where God speaks, using our Bibles as the foundation of how we think, act and speak. Remember the process we’re going to work through? To be clear, I’m not totally oblivious to reality. I understand that true followers can still land on the opposite sides of issues after studying Scripture, but it’s still our best step to faithfully walk with God. The beauty of looking to God through His Word together is that we’ll be unified in our purpose to seek Him instead of divided by parties or church circles. Read this blog post about a simple but profound way to study Scripture. Print the handouts so that you can give the 3-step method a try. From wherever you’re currently reading the Bible, take one passage of up to 10 verses this week and do the 3-step Bible study. Leave a comment with a picture of your notes on the Facebook post pinned at the top of my Facebook page and tell something you learned. 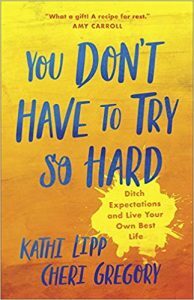 To keep it fun, anyone who posts a picture before November 1st will be entered to win a drawing for Kathi Lipp’s and Cheri Gregory’s new book You Don’t Have to Try So Hard! I plan to utilize this 3-Step Bible study method tonight with a couple ladies who join me at my dinner table each month. The SPACE step is new to me, and I am excited to watch the affect on our study tonight. That totally excites me, Charla! Periodically I use the 3 steps with my women’s Sunday school class. I haven’t done it in a long time, and you’ve encouraged me to bring it around again. It’s such a beautiful tool, because it’s profound but simple enough to even use with children. I am so glad you have this link. I loooved every minute of your conversation. I loved your candid, profound, natural, authentic expression of you and your relationships and your walk with God. I was laughing, then my eyes welled with tears, then I was saying “Awwww” – you took me on a journey that was quite therapeutic. Amy, thank you for being you and may God continue to shine upon and through you. Andrea, my nations-loving heart just did a little flip! Thank you for your encouragement. It was a fun interview to do, and I’m so glad it encouraged you. Thanks also for seeking a copy of Breaking Up with Perfect. My decade-long journey is in there with all the beautiful lessons of God. To me, this is right on! This is the need we all have. You’ve pumped me up, Joanne! Let’s go! This is great Amy. Thank you so much. Yay! I’m glad you’re going to give the 3-step method a whirl. Make sure you comment with a pic on the FB page too. (It’s the one pinned to the top.) Can’t wait to learn from what God teaches you!